Groupama sailing team suspended racing from the fifth leg of the Volvo Ocean Race after the mast broke just above the first spreader. 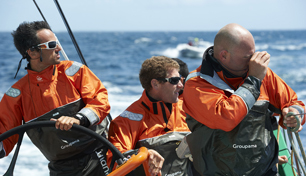 The crew are all safe with the team 60 nautical miles south of Punta del Este. "We just lost the rig now, all the crew is safe. We are working to stabilize the rig on the boat. Not easy," skipper Franck Cammas told Race HQ. "We suspend the race now and have a look at what doing. We are 59 miles to Punta del Este." Groupama 4 was holding a narrow lead over PUMA's Mar Mostro in the leg from Auckland to Itajaí in southern Brazil when the incident was reported to Race control around 1540 UTC.